Sturgis at the Belle Fourche Invite, crowning two champions. BELLE FOURCHE, S.D. - Dickinson, N.D. captured the team title of the Belle Fourche Invitational Saturday, with 285 points. Rapid City Stevens finished just two points behind in second and Sturgis brought home third with 226.5 points. 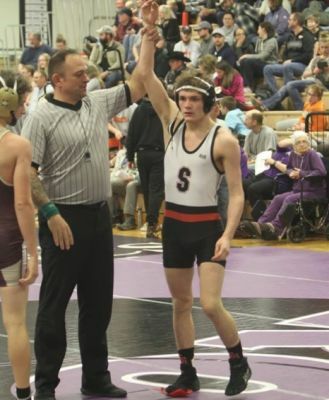 The Scoopers crowned two champions on the day with Kaden Olson winning at 106 pounds and Jacob Wood at 120 pounds. Stevens crowned four champions with Landen Fischer at 113, Cody Stockman at 126, Darien Malone at 138 and Caleb Brink at 170. Hot Springs crowned two champions with Kody Hagen at 145 and Garret Heil at 195. Chance Grill of Custer/Edgemont brought home a 152 pound championship, Evan Heher of Spearfish won at 220 and Lead-Deadwood's Rob Lester won at 285 pounds. In other wrestling action, Rapid City Cenral came in second at the Brookings Invitational. The Cobblers crowned two winners with Cael Larson at 113 pounds and Wyatt Jungclaus at 170. Pierre won the team title with 209.5 points.